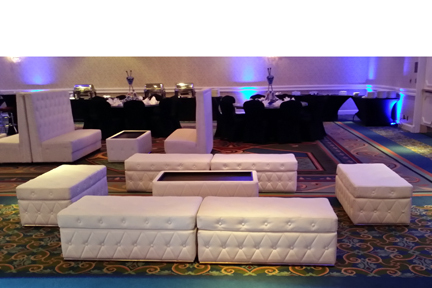 Lounge Furniture Rentals - create a fun and upscale look to any party with our white leather couches and white tables. Great for bar and bat mitzvahs, high school, and other corporate events. Lounge Furniture - Create a fun and upscale look to any party with our white leather couches, low cocktail tables, rugs, throw pillows, and/or LED cocktail tables.